"The Finest Guitar Instruction By Our Master Teachers"
After 6 years of running our incredibly successful International Guitar Camp in Northern California, TotallyGuitars is returning to Amsterdam for our second IGC-Europe. Once again I will be at The Samaya Conference Center the weekend of July 25-28, 2019 with my talented colleague Vanessa Bot. The camp will revolve around concentrated learning time with the instructors and other students, and on improving performing skills with Open Mic time and Performance Workshops. There will be sessions set aside to play in groups and collaborate with others, semi-private lessons with Vanessa and me, and even a bit of free time to get some practicing in. IGC Amsterdam will be limited to 15 students in order to maximize individual interaction with the instructors. Don't miss this great opportunity to take your playing to another level and meet a group of musicians who are part of the TotallyGuitars Family. The International Guitar Camp, or IGC for short, is a Guitar Player's community event presented by Totally Guitars offering some of the finest guitar playing, training and instruction by an elite panel of guitar instructors who truly are "Masters of the Craft". This International Guitar Camp event, the brainchild of Neil Hogan, Matt Williams and others in the TotallyGuitars.com family, started in 2013 and was held annually in beautiful settings in the Santa Cruz Mountains of Northern California. In 2017 the IGC was moved to the shores of Monterey Bay at the Asilomar Conference Center. Once again we are taking a mini version of the IGC to Amsterdam for a weekend with our two master instructors, Neil Hogan and Vanessa Bot. We expect to be joined by guitar playing enthusiasts from all around the world, many from the TotallyGuitars.com community and a lucky few who find their way to the "Register" button on this page. Most of our players have come to multiple camps, continuing their journey of musical development and recharging lifetime bonds formed at earlier camps. Be sure to check out some of their experiences on our IGC Highlights page. For those players who decide to join us at IGC Amsterdam we promise the musical experience of a lifetime, a concentrated learning environment with guidance, advancement, and immersion in all things guitar and music. When and where will IGC Amsterdam be held? The International Guitar Camp is truly going international this year as we bring our staff to Amsterdam the weekend of July 25-28, 2019, at the Samaya Conference Center, outside of Amsterdam. More info on the venue is further down this page. What will we do at IGC Amsterdam? We will first meet on Thursday evening for an informal night of getting to know each other and playing some music. Friday will start with Neil and Vanessa playing a bit and talking about music, then opening into a Q&A session. The rest of the day will include time for individual and group instruction, a Play-Along class, and a Performance Workshop (offering suggestions on stage presence and playing in front of others). The plan may change directions depending on what the players might like to do. We can easily adjust things to what people might want to accomplish because of limiting the size of the group. The evening will be time for everyone to join us for an Open Mic Night and playing a song or two for the group. This is totally optional of course but if you have not done much of this you would not be able to assemble a better audience for your first public performance. What does SAMAYA say about the food? We can proudly say that we are known for our Burgundian vegetarian cuisine. If we are allowed to accept the reactions of our guests, you will taste the care and attention with which the fresh dishes are prepared. Eating at Samaya is pure culinary enjoyment. Guests who are used to dining in restaurants, which have a big name, also like to come back to us. All dishes are freshly prepared daily with pure ingredients. The chefs use as many organic and regional products as possible. We are happy to adjust the number of courses of your dinner to your wishes. And when you want you can complete your meal with our delicious house wine. For breakfast and lunch you will find a richly varied buffet. At lunch there is also soup, salad and in consultation a hot snack waiting for you. Our apple-pear juice comes from our own garden and we can also recommend the homemade apple pie. Who are the “Masters of the Craft” that will be training? Neil Hogan: Your host and Master Guitar Teacher for the IGC, Neil will be involved in all aspects of this event and will be involved in all sessions. He will also be offering semi-private lessons to everyone. Besides the incredible teaching he will be providing, Neil will be literally "everywhere" at this event. So reach out to him if you need anything. Vanessa Bot: Vanessa is certainly no stranger to anyone who has spent any time at TotallyGuitars.com. She has become an integral part of the TG teaching team since she joined in mid-2013. She now has nearly 200 detailed lessons on the site which are very popular, and brings us a new one every week. She will be on hand to give one-on-one teaching sessions, coordinate the open mics, assist with collaborations, and will run play-along group sessions. We are thrilled that we are able to bring the mini-IGC to her home in The Netherlands. Space is limited for this incredible event as we are committed to every student having easy and personal access to all the instructors. We need to limit attendance to 15 campers. Time is of the essence and don't let this event sell out without you. We don't want you wait until the last minute and miss out on what is destined to be one of the best Guitar Playing, Training and Guitar Instruction live event presentations of the year! Be sure to visit the Guitar Instructor bios below to really understand the power of what we are offering you at this event. We are excited and look forward to seeing you at this event. Neil Hogan has been a professional musician and guitar teacher for over 40 years. As a performer he has shared the stage with the likes of John Renbourn, Al Stewart, Keola Beamer and Laurence Juber. His teaching career started as a teenager and he has given private lessons continually ever since. This includes over 30 years at his own shop, Joplin & Sweeney Music in Los Gatos, California. His extensive experience in instruction has carried over to TotallyGuitars where he has been the teacher-in-residence since its launch in April of 2009. Neil's teaching skills are now available and appreciated by thousands of students around the world and many of them will be joining us at our International Guitar Camp. Vanessa has been a professional music teacher for more than ten years. She teaches guitar bass, piano and the drums from her teaching studio in Zaandam, The Netherlands. She has also been developing guitar and piano teaching video tutorials for sometime. Vanessa has been playing and performing for more than 35 years. In that time she's played in many bands, from eleven piece bands to duos to solo performance. She's mostly played the guitar and sung, but also the drums and piano. She plays and teaches a wide range of music from classical to contemporary, in a range of genres. Some of her personal favourites groups and artists are Jason Mraz, The Eagles, Elvis, The Beatles, Crosby Stills and Nash, Bon Jovi, U2, Pink Floyd, Anouk, Adele, Robbie Williams and many more. A Child Prot�cg�c�_� Born in Vienna, Austria and raised in Los Angeles, Max picked up the guitar for the first time at the age of 12 and has never looked back. Before earning his Bachelors degree in guitar performance he spent his teen years performing with rock bands in Hollywood at such venues as The Whisky A Go-Go, The Roxy and The Key Club. A Global Teacher He was invited to attend a Master's program in Germany where he studied jazz and classical guitar and competed in numerous international competitions. While living in Germany, Max taught guitar in several music schools including the American International School where he headed the music department. Despite his studio and live performances, he has always had a passion for teaching, and instructing all players of every level on how to maximize their potential. Doug Young is a San Francisco Bay Area guitarist, composer, author and teacher. Doug focuses on solo fingerstyle acoustic guitar, but also draws on an extensive background in both electric and acoustic guitar, and has performed in groups from rock bands to big band jazz, as well as performing as a solo artist. Doug is a Contributing Editor for Acoustic Guitar Magazine, for whom he has written well over 100 articles, and has also had his music published in Fingerstyle Guitar Magazine. He is the author of the best-selling Mel Bay instructional book, Understanding DADGAD: For Fingerstyle Guitar as well as Acoustic Guitar Amplification Essentials, from String Letter Publishing, and has taught workshops at the Healdsburg Guitar Festival, the Marin Community Music School, and others. Doug is also an experienced recording engineer who has taught workshops on recording for solo guitarists. His recent projects include recording and mixing Anton Emery's debut CD, Noone Lasses, and engineering tracks for Steve Baughman's Life in Prism as well as his own CDs. Doug has released two CDs of his compositions and arrangements, Laurel Mill (2003), and Closing Time (2011). His composition "Autumn Roads" won "Best Instrumental" from the International Acoustic Music Awards (IAMA). Doug was with us at our inaugural IGC in 2013 as a guest presenter and came on board full time last year offering his expertise in working in DADGAD and other alternate tunings, as well as leading a workshop on video production, VideoShop as we came to call it. We are thrilled that he is back on board for 2015. Jim is a well-known vocal instructor, music innovator, performer, the founder of Showcase Music Institute in San Jose, California, and creator of music programs for adults and children. Jim joined us a few years ago with the launch of TotallyVocals.com and has been a big part of the TG Community since then. Jim teaches rock, jazz, blues, pop, world beat, R & B, and funk styles with emphasis on ear training, recording techniques, emotional delivery and live stage performance. Jim's knowledge in the areas of holistic/alternative medicine contributes to the development of the complete vocalist. Located in Central Netherlands in the beautiful Kromme Rijn area between Betuwe and Utrechtse Heuvelrug. While you are only 15 minutes away by car from the city of Utrecht, our guests here experience a soothing silence, which is only interrupted by the sound of birds. It is a historic place, on the border of the Limes, the ancient Roman Empire. Historically, because here the last convent of the Netherlands was built, according to the old guidelines of the Catholic Church. Our building is known in the area under its old name: priory Gods Workyard. 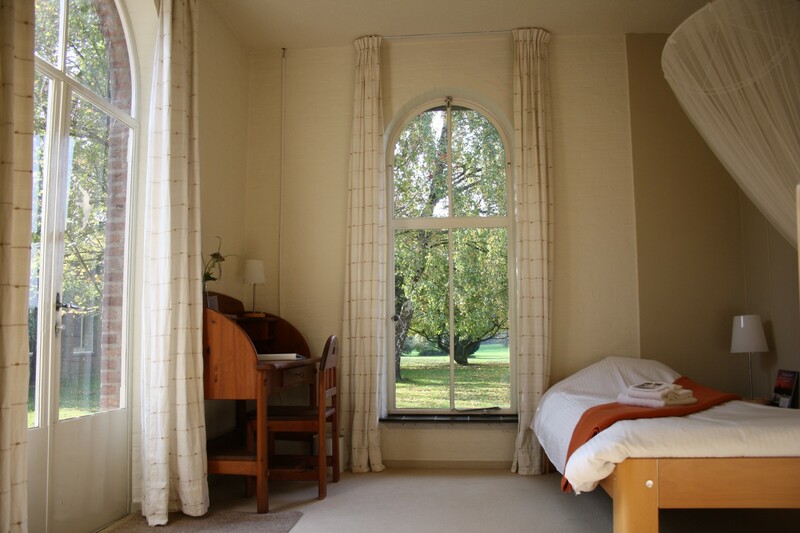 The building is surrounded by a 4-hectare English landscaped garden with beautiful sightlines. Because of the diversity of trees and places, many of our customers actively participate in the development of their program. The building itself is a municipal monument. Unique are the light, wide corridors and the spacious view from every room and almost every guest room. Wherever you walk, you always have a view of the garden and / or the surrounding area. Samaya is a small-scale conference center in the heart of the Netherlands, near Utrecht on a green spot between Betuwe and Utrechtse Heuvelrug where it can still be really quiet. You will find an atmosphere of beauty, lightness, space and tranquility and a team that guarantees a carefree stay. We offer a hospitable stay for groups as well as for individual guests. Our 4 rooms all have their own outdoor space. Our 26 guest rooms are comfortably furnished and have their own sanitary facilities. In the Chapel you can go for meetings like a concert, a lecture or a silent meditation. Browse the Samaya Conference Center website for a complete list of services. Early Bird Registration for IGC EUROPE is €895. It includes 3 nights lodging at the Samaya Conference Center, all workshops and events, and 3 meals a day. Rooms at this rate are based on double occupancy. Single rooms are available for €1045 and a room with a non-playing loved one runs €1495. If you arrive by train, get off at Driebergen-Zeist railway station. Usually a number of taxis are waiting for you there. You can also take the bus from Utrecht-CS to bus stop Werkhoven. OV bikes are there. You cycle through the picturesque Werkhoven and along the beautiful Hollendewagenweg in 15 minutes to Samaya. Recommended route by car: A12, exit Bunnik, direction Wijk bij Duurstede. Turn off Werkhoven exit and take exit Culemborg a few kilometers further. From here you follow the yellow Samaya signs. There is ample parking on site. Copyright © 2018 IGC. All Rights Reserved. Your decision to register for TotallyGuitars International Guitar Camp constitutes your acknowledgement of and consent to all of the registration, payment and cancellation terms and conditions listed. TotallyGuitars International Guitar Camp reserves the right to use photos and videos of any attendees, and to use such images for marketing purposes. I hereby agree to release my photograph to International Guitar Camp without compensation. I hereby release TotallyGuitars LLC, and all associated entities, from all claims, liabilities, loss to property, damages, injuries, etc. arising out of or in connection with my purchase and/or participation in any aspect of International Guitar Camp. Camp dates, instructors and agendas are subject to change. TotallyGuitars LLC, its affiliates and entities associated with the TotallyGuitars International Guitar Camp will not be responsible for any claims arising out of changes or cancellations in your travel, lodging and related costs. We recommend that you purchase travel insurance. Sign up for the mailing list and stay in the loop on all of the latest IGC news. Share the news with your friends and family.